Since 1925, Tomahawk has been manufacturing high quality, easy-to-use traps for hunters and outdoorsmen with a wide variety of interests, including snake tongs and hooks, cat graspers, paste baits, bird and animal nets, animal control poles, fish and turtle traps, telescoping syringe poles, odor eliminators, and more. Tomahawk also sells dog leashes and muzzles, as well as cat accessories. 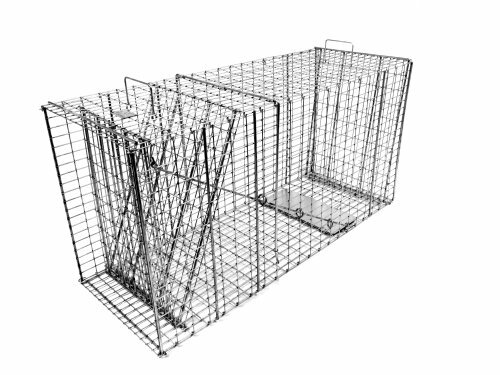 Collapsible steel trap for bobcats and foxes. Sets up quickly and folds flat in seconds for easy storage. Durable 12-gauge wire mesh steel. Locking doors ensure capture. Dimensions: 45L x 15W x 20H inches. If you have any questions about this product by Tomahawk, contact us by completing and submitting the form below. If you are looking for a specif part number, please include it with your message.